Garden Hotel Ripa offers to all its guests on holiday in Vieste an all-inclusive treatment with private beach included in the price. There are not many hotels in Vieste that can boast a private beach: ours is a new bathing establishment, completely renovated with modern and functional decor. Even the spaces will amaze you: we know that sometimes beach life can be anything but relaxing, for this reason we decided to broaden the space between one beach umbrella and the other, giving you the peace of mind you need, arranging them in a harmonious manner and avoiding tight joints. 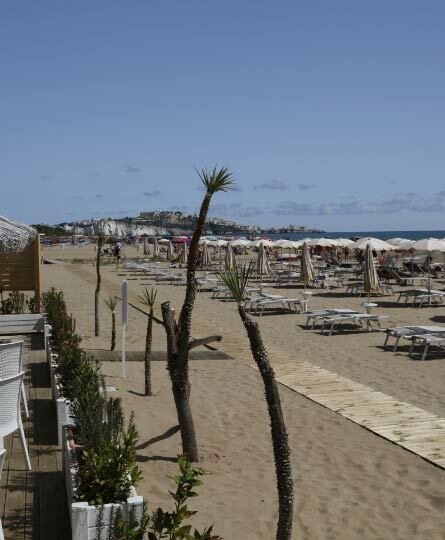 Our private beach is located just in front of our hotel, you will see it as soon as you cross the seafront.